With over 3,000 islands scattered around its rocky shoreline, the coast of Maine is a unique part of the American landscape. From Cape Elizabeth to Harpswell, the Casco Bay Quilt is a perfect memento of days spent living the coastal life. 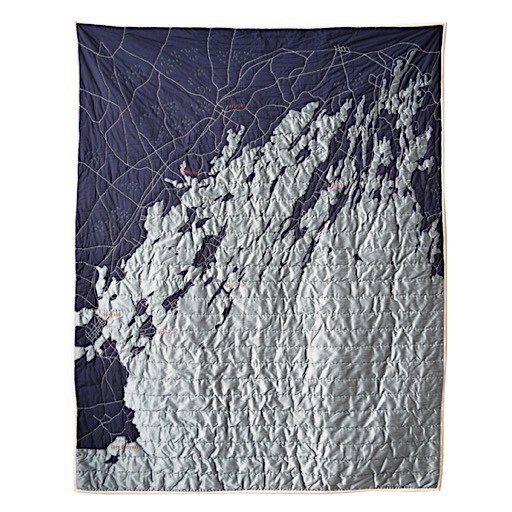 The twisting shoreline and individual islands are meticulously appliqued with navy polysilk onto a soft cotton backing of pale blue cotton; roads and ocean topography are entirely hand-stitched. Red stitching denotes the location of the area’s towns. Machine wash on gentle cycle. Hang dry. Dimensions: 52 x 72 inches.